Quarter Master Driveshaft - Carbon Fiber UNIVERSAL - Dezod Motorsports Inc - Home of the automotive performance enthusiast since 2002. 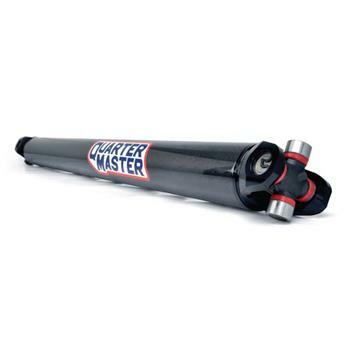 Carbon Fiber Driveshafts for Dirt Late Models offer maximum weight reduction and decreased MOI that provides for more immediate acceleration and deceleration in and out of the corners where momentum is a premium. The directionally orientated space-grade carbon maximizes torsional strength both radially and laterally, which equates to the ability to perform under the most extreme conditions in the highest operating RPM range. Finished with a smooth, non-load bearing composite outer layer and lightweight, black-anodized billet aluminum ends using standard 1310 U-joints, Quarter Master Carbon Fiber Driveshafts are the strongest, lightest and most durable driveshafts available for Dirt Late Models. These driveshafts are also available in white for those series, sanctioning bodies and tracks that require a white driveshaft.